Hard water is responsible for lime and calcium (scale) build up on your boilers, faucets, and showerheads; water spots on your glassware after they've been through a dishwasher cycle; the graying of clothes over time; the reduced lathering quality of your soap; and the challenges you have removing all of the soap from your skin and shampoo from your hair. Since the hardness of your water largely depends on where you live, the only way to reduce the minerals in your water is by installing a water softener or conditioner. With a water softening system, you'll immediately feel the difference. You'll also prevent excessive scale build up in kitchen and bathroom fixtures and improve the performance, efficiency and life expectancy of a variety of appliances that use water, such as the dishwasher, washing machine, water heater, ice maker, and coffee maker. At Steve's Service, we sell and install nuvoH2O salt-free water conditioning systems. nuvoH2O's water conditioners are highly effective at softening water for both homes and businesses. They're also affordably priced, easy to maintain, and small enough to be installed virtually anywhere, including garages, cabinets, closets, and more -- all they need is access to a water line. Many cities throughout the Inland Empire have issued ordinances to prevent the installation of new and replacement rock salt or potassium chloride "self-regenerating" water softeners. Some cities are even offering rebates to have them removed. That's because because these systems produce an extraordinary amount of salt as a byproduct. This salt gets into our water treatment system and eventually ends up in our groundwater and recycled water supplies, threatening our ability to use it in the future. In contrast, instead of using salt to remove calcium and other minerals, nuvoH2O uses chelation technology, which aims to neutralize the mineral ions so they don't precipitate out and form scale. This salt-free water softening process is highly effective at preventing and removing hard-water buildup in even the harshest of environments, and yet is still eco-friendly and healthy for drinking, bathing, washing, and plant and lawn watering. 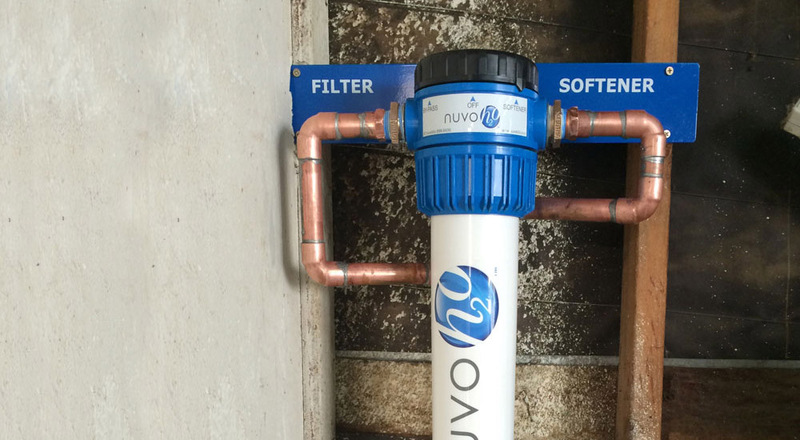 As an added bonus, nuvoH2O softened water tastes better and costs about half as much as salt softening systems for both installation and maintenance. Steve's Service is qualified to service and repair most major salt-free water conditioners, including those made by nuvoH2O, Falsken, and a variety of brands found at home improvement stores like Lowe's and Home Depot. (The only brands we don't service are Culligan and Rayne, who exclusively sell, install, service, and repair their own systems.) Salt-free water softener maintenance consists of a quick visit to simply replace the cartridges once every 6 to 12 months, depending upon your usage. Estimates for water softening system installations in San Bernardino County are free. We also offer under-the-sink reverse osmosis systems to improve the taste of your drinking water. To determine the best water treatment solution for your property, give us a call today.